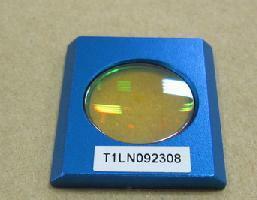 Do you know any place where we can buy spare parts (focal lenses, mirrors, etc) for a GCC X380 laser cutting machines? In Europe preferably, but other regions would be considered as well. Last edited by Bert Kemp; 01-25-2015 at 6:18 PM. Is a co2, but my lense comes in a frame, so I suppose is specifically designed for this model, right? Well I'd goggle lens for your machine, you can always get them from the company also. Be careful which adhesive you use - you might want to research this a bit. There are hundreds of Loctite products. Laserbits sells Loctite 409 which they claim is good for optics although Henkel doesn't sell it specifically as such. It is a gel cyanoacrylate which is better than the regular, as there is less chance of getting adhesive where it is not wanted. If that happens, you have probably ruined the optic. Some people use a few dots of epoxy. I mounted a lens in a holder using three #2 screws with three thin plastic washers bearing just over the edge of the optic. I preferred to do it this way as I could remove and change the lens without dealing with adhesives. $350 if I remember. I haven't found the holder anywhere else yet. The mirror holders appear to be steel plates but I'm not sure what they use for an adhesive. little pieces and sanded/polished the steel plate before putting the new mirror on. Not pretty. acrylic if you touch it, and that smears an acrylic goo onto the lens. I can't find any of them. So I have to buy them again. A small bit of %100 silicone caulk would do. If you get it on your lense it would peel right off after it drys. Try a little lacquer thinner on the glue to loosen it up before removing from the frame. I do have a couple of cnc routers. Let me know the dimensions and I'll see what I can do. I forgot to mention, I do have a couple of cnc routers. Let me know the dimensions or work up a drawing and I'll see what I can do. Tried that, Burt. I wish it would work! Last edited by Chris Corwin; 01-30-2015 at 7:45 PM. Yeah, I can machine aluminum. I have CNC routers, not a mill but they should do alright. I have machined out quite a bit of aluminum. I even scratch built a CNC router for school on my large machine.just send me the measurements or a drawing and I'll see what I can do. The lenses can be had almost anywhere as stated - just measure the "hole " with a caliper and find a repalcement. Since you need to remove the LENS, and not KNOWING how its secured- it "almost" looked to me in the picture it was "captured" in the carrier. That being said if it looks like it will "pop" out, .. solvent- ( acetone , super glue( ca) debonder - available at hobby store Denatured alcahol, Touelulene, etc ) possibly even soaking in water might lossen the lens. The critical thing I see here is not to damage the carrier by physical force. All times are GMT -4. The time now is 7:22 AM.